Happy New Year to all of you! Here’s wishing you a WONDERFUL 2018!! First is a wonderful new couch from Annie Morrison!! To quote Annie’s Etsy listing: “A Mid Century Modern styled Sofa in soft Light Yellow garment leather with matching ottoman”. It’s absolutely amazing! A true work of art! 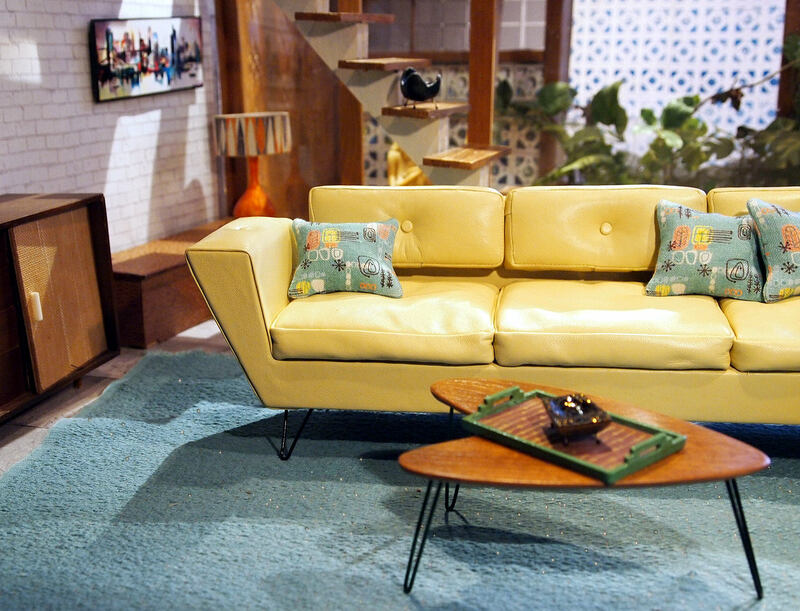 Also by Annie is the wonderful teak table, ashtray, pillows, and little vintage magazines. Next is a new doll seamstress, new for me at least. She is from Poland. 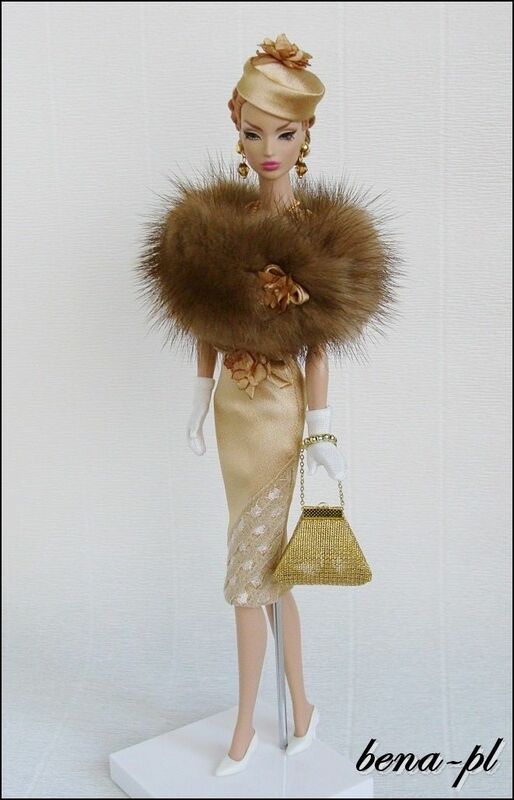 Her name is Bożena and she lists her Fashion Royalty doll outfits under the name bena-pl on Ebay. Her outfits are absolutely stunning and really capture the vintage retro look! If you follow her auctions, you’ll see her outfits are in high demand. Bożena’s facebook page is here, but is in Polish. If you wish to see more of her outfits, here are a bunch collected on Pinterest. Finally, this minor dio is meant to showcase three of my recent 3D printing projects. 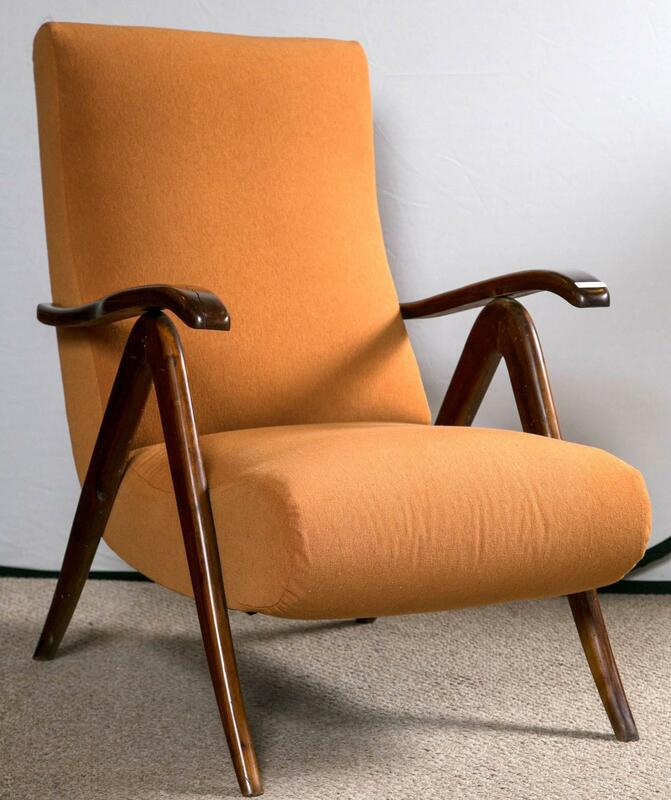 First is a really cool 1950s Italian mid century reclining lounge chair. A pair of them can be bought here for the mere price of $3,250! This was a little over my budget (LOL!) and so I decided to make a 1/6th version that cost well below three grand! 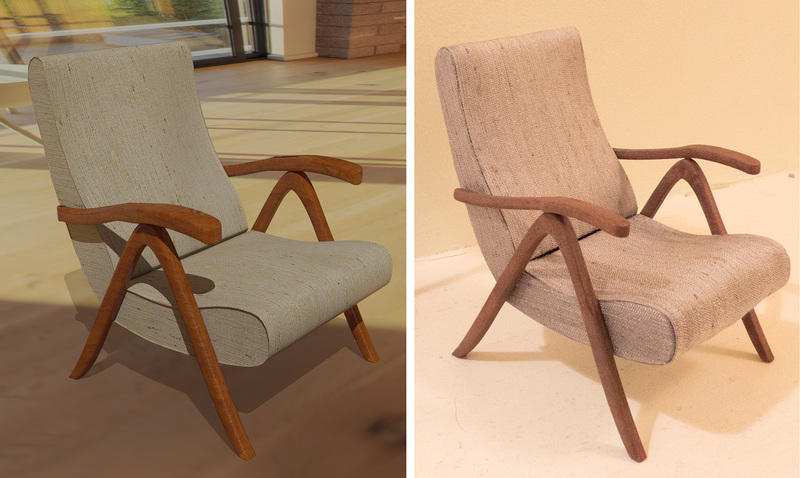 The next image shows, on the left, the computer design, and on the right, the final actual little chair. This was before I applied clear coat to the arms and legs. Overall, the mini version is pretty close to the original. I opted for fabric that matched Annie’s amazing leather couch. On a side note, it took me almost 2 weeks to apply the clear coat to the model. I didn’t really know what I was doing and figured it out as I went. I think the paint job did pretty good at simulating wood grain, and the clear coat came out the best I could make it! My second project was a mid century floor lamp that was listed on Ebay some time back. My shade is slightly different from the original, but I am happy with how it came out. I got real brass 3D prints of the brass parts of the lamp, except the brass part of the stand, which was good ole K&S brass tubing. It took me 1 day to paint and assemble the lamp. A far cry from the 2 weeks I spent on the Italian chair! This dio also showcases the Mondrian clock I made last summer. 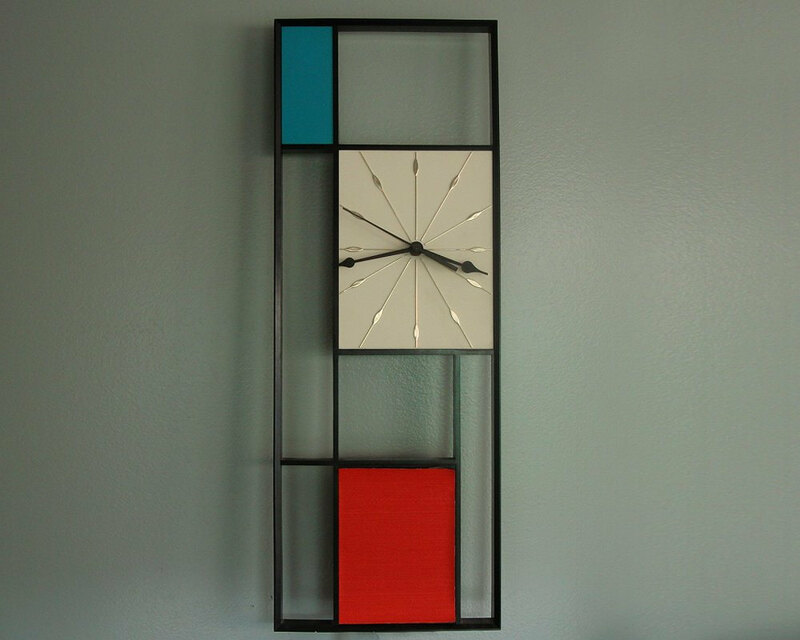 The image below is from an Etsy listing of a mid century Sunbeam Mondrian wall clock I used as a guide. To get the fine lines on the clock face, I 3D printed a stencil and used mirror spray paint through the stencil. The last item is the area “rug”. 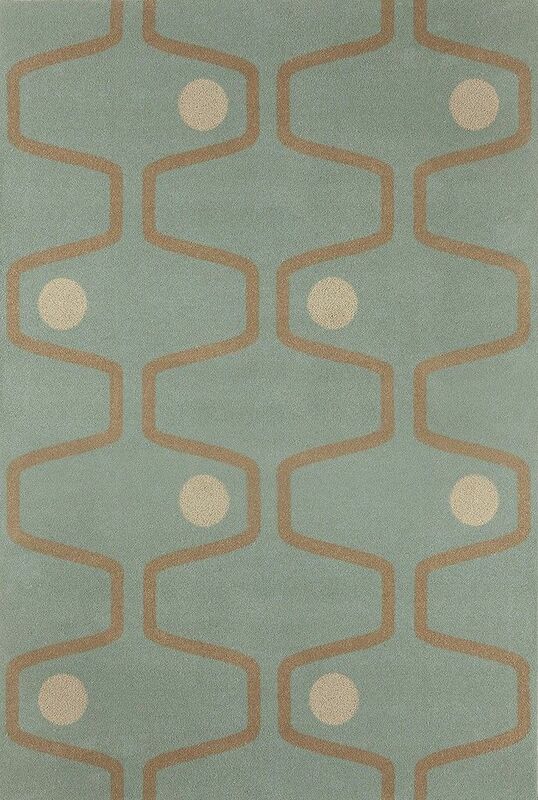 This is a Brinton Festival Celadon rug that was offered in 2013, as you can see in their 2013 catalog. The pattern is from the Royal Festival Hall carpet designed by Peter Moro and Leslie Martin in 1951, as explained here. Brinton no longer sells this rug, but here is an auction listing for a used one that sold recently. I tried a couple different approaches to make this and ended up printing on plastic. Not the most realistic, but it seems to have worked well enough for the photos. After leaving Miss Patsy’s house, Madame H waits to meet a secret benefactor in the halls of power.